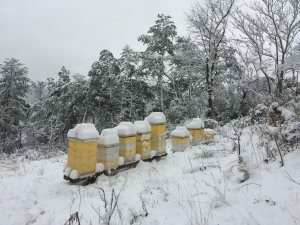 Anniversary Party and January Offerings from Wild Mountain Bees! WILD MOUNTAIN BEES ANNIVERSARY PARTY! We have just loved our move to downtown Weaverville – what a warm, welcoming community we have come into. Join us to celebrate honeybees, their amazing overwintering journey, our first year at our new location – and YOU, our awesome customers! We will have drinks and snacks as well as raffling off (1) package of bees! A package includes 3 lbs of bees and a queen. To enter the raffle, you can buy tickets at the shop for $5 each! We will be announcing the winner at 7 pm that night. If you do win and are not present, we are happy to give you a call and let you know! We will see y’all there! Following the free community offerings, Sarah will offer a Beginner Beekeeping Class Series. This class will offer a whirlwind of information from hive placement to season-long management. In addition to the lecture portion, the fee for this class includes a 2-hour, hands-on, in-the-hive portion when the weather begins to warm in the spring. Hands-on dates are TBA – we will offer multiple dates throughout April and June. The new beekeeper will find this invaluable in gaining comfort and confidence around a hive. As always, thank you for your unwavering support! Looking forward to sharing 2018 with each of you.